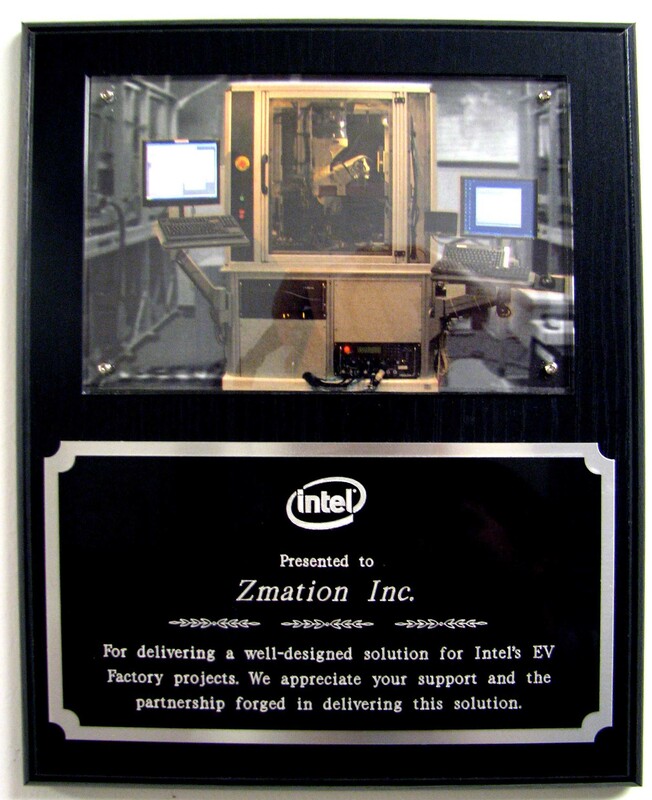 Zmation, Inc. announces Intel Electrical Validation Award : Zmation, Inc.
Portland, OR USA, November 27th, 2013: Zmation, Inc., a worldwide supplier of custom industrial automation equipment announced receipt of Intel’s Electrical Validation Award for delivering a well-designed solution for Intel’s Factory projects. “Our receipt of this award enforces our continued development of diverse and complex automation platforms that can be rapidly retooled for new applications. The unique software flexibility allowed us to rapidly develop and test new processes and give both of us a competitive edge over our competition.” said Craig D. Howard, President of Zmation. 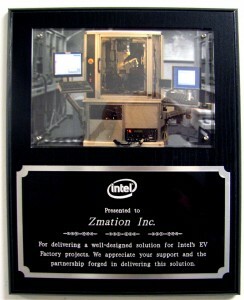 About Zmation: Founded in 1994, Zmation, Inc. is a worldwide supplier of custom industrial automation equipment. Their cutting edge automation software with its unique Universal Automation Language provides rapid software deployment and control of complex processes incorporating vision, robotics, lasers, motion control, force, temperature, parts feeding, and material handling. Their customers benefit from the ease at which they can adjust process parameters, add new user interfaces, change software functionality, and reuse equipment on future products. Their software is used to retrofit other manufacturer’s equipment allowing customers the benefits of a common software interface on their production floors.